This is one of my favorite photobooks. It has it all – moving images, superb design and a great story. 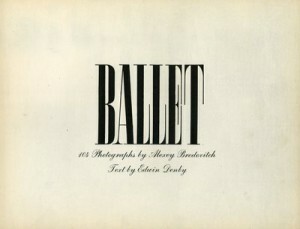 It stands as a one-of-a kind testament to the innovation of the photographer, Alexey Brodovitch, who created Ballet having already established a name as a respected and quite brilliant art director. An inspiration to both his peers and visual creatives working today, Brodovitch always had an eye for the original. He placed the photograph at the center of his design work and used its elements to finalize the look of a feature’s layout. Look at any high-end magazine today and you’ll see the influence of this approach to typography and the use of images. His eye took Harper’s Bazaar magazine to new levels in the 1950s, and his eye is why I love this photobook. I find it perfect that a man so in love with moving forwards would choose to document the motion of dance. The award-winning Civil Rights photographer Bob Adelman once told me that Brodovitch was unrelenting in this pursuit of original and imaginative work. Before becoming his assistant, Adelman first attended one of his infamous courses in New York. Adelman was not the only photographer Brodovitch encouraged. His first assistant in New York was Irving Penn. He is also famous for showcasing and developing the work of Richard Avedon, Diane Arbus, Eve Arnold and Hiro amongst many others. He was also was the first art director to give an assignment to Robert Frank in the US. From his students he demanded constant innovation and despised notions of limitation, and Ballet is proof he was capable of creating the kind of imagery he encouraged others to create for themselves. Yeah, this is definitely one of my favorite photobooks.